By all appearances, Danai Gurira is on top of the world right now. 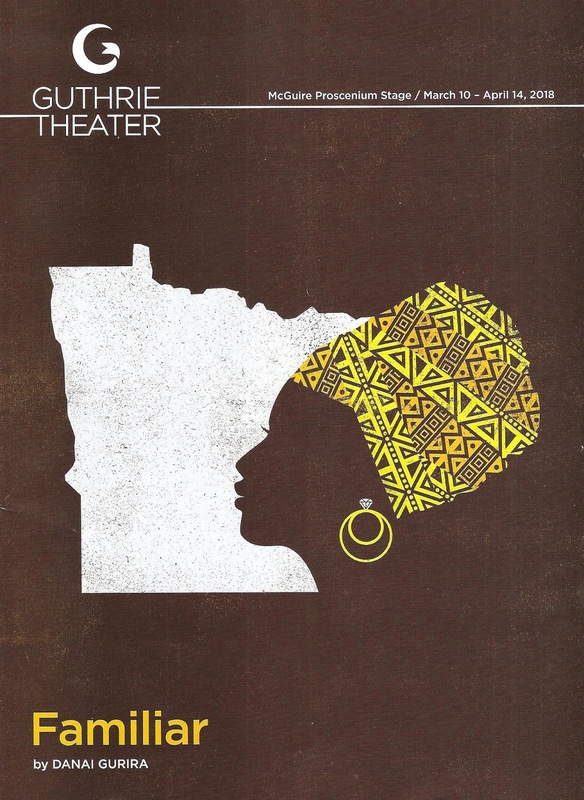 She stars in the current biggest movie in the world, Black Panther; is a cast member of one of the most popular shows on TV, The Walking Dead; recently had her Broadway premiere as a playwright with Eclipsed, the first Broadway play with an all-female and African American cast and creative team; and now her play Familiar is premiering in Minnesota, where it is set and where she spent some of her formative years (she was born in Iowa, raised in her parents' native Zimbabwe, and returned to the Midwest to attend Macalester College). Phew! How can one person be so accomplished and talented? I don't know Danai, but I'm guessing the answer is many years of hard work and dedication. All of this is reason enough to see Familiar at the Guthrie, with all of the attending buzz, but the reason to love it is that it's a really wonderful play with a brilliant cast. 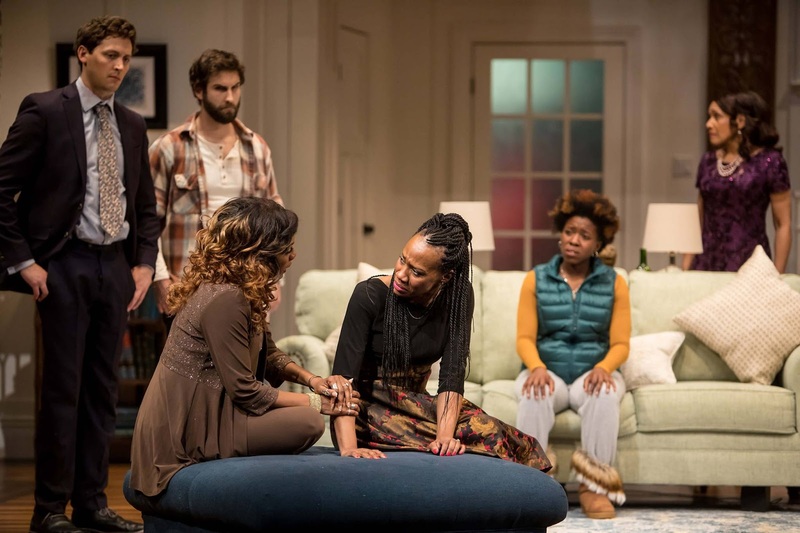 As the title implies, it's about families, one specific Zimbabwean-Minnesotan family in particular, that will feel familiar to anyone with a family. The family in question, that Danai Gurira has so beautifully and specifically created inspired by her own, is headed by parents Donald and Marvelous, professionals who immigrated from Zimbabwe to Minnesota to make a better life for themselves and their families (and, presumably, for the weather). Oldest daughter Tendi has "found Jesus" and is about to marry Chris, "a little white boy from Minnetonka," while younger daughter Nyasha has just returned from a trip "home" to Zim, and is embracing all aspects of her culture while chastising her parents for not teaching their children anything about their homeland. Such is the dilemma of immigrants; they want their children to be seen as Americans with all of the privileges that implies, but it often comes at the sacrifice of their culture. How does a nation of immigrants find that balance between maintaining our specific individual cultures, while forming a common identity? Aunties Maggie and Anne (Marvey's sisters) arrive to help out with the wedding, and Marvey is none to pleased when the bride and groom ask Anne, the oldest sibling and the only one to have remained in Zimbabwe, to perform the traditional ceremony of "roora," or bride price. The groom needs a representative, so overachiever Chris invites his less achieving younger brother Brad over to the house. 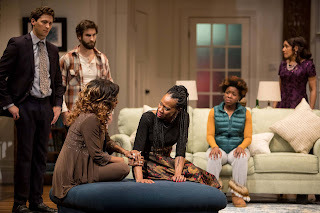 Culture clash, sibling rivalries, and long buried secrets create the requisite drama in this hilarious comedy, with some seriously poignant emotions thrown in, so that you might find yourself laughing for a couple hours, only to end up in tears at this beautifully flawed and human family that loves each other no matter their mistakes. Director Taibi Magar returns after her spectacular We Are Proud to Present last year, and beautifully balances the comedy, drama, and emotion of this piece. I cannot say enough good things about this cast, a nice mix of local favorites and nationally recognized actors. Every one of them is so wonderful in individually creating a specific and realistic character, and together they have a truly believable family chemistry, warm and prickly and full of history. Harvy Blanks is so sweet as the doting father of these two young women; Perri Gaffney is the strong and tough mother who expects nothing less than the best for her daughters; Wandachristine and Austene Van are terrific as the aunties, one traditional and the other trying to find her way in America; Shá Cage and Aishé Keita are perfectly cast as the two very different sisters; Quinn Franzen (a cast member of We Are Proud to Present) makes a charming supportive boyfriend; and last but not least, Michael Wieser is more than just the comic relief as Brad, a man who knows exactly what to do in the case of hypothermia. This is one of those sets at the Guthrie that you just want to climb up into and stay a while. Adam Rigg has created a spacious, elegant, and comfortable home for the family, with big windows that show the changing light of the day (and snow!). In other words, it's a good representation of a upper middle class suburban Minnesota home. As you may (or may not) have noticed, I almost always scan the playbill as the leading image of my posts. Partly it's because when I started blogging almost eight years ago production photos were not as readily available, and partly it's because I find the images that theaters create to represent their work fascinating. In all those years, this may be my favorite playbill cover design ever. I love the way that the woman's profile forms the Eastern border of our very uniquely shaped state, while her traditional Zimbabwean headdress shows us that she's not what one typically thinks of as Minnesotan (i.e., blond and Scandinavian). But she is Minnesota, because Minnesota is made up of all its inhabitants from lands and cultures all around the world. This is the Minnesota I'm proud to call home, and this is a play I'm proud to have represent Minnesota. A complicated, messy, loving family celebrating each other as they strive for that balance between the past and the present, their original home and their chosen home, tradition and a new life. 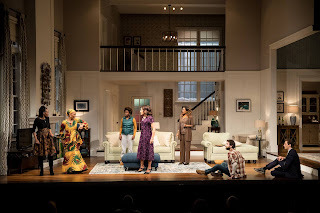 Familiar continues at the Guthrie proscenium theater through April 14.